Jack was a bit of a fatty (40 lbs. overweight) when Kate O’Brien and her husband of Camarillo, CA, saw him on Petfinder. But the Labrador Retriever had been at Canine Adoption and Rescue League in Ventura, CA, for a year, and to them, that was way too long. This guy needed a home to call his own. Read Jack’s happy tail in Kate’s words. Once they had adopted him, they knew they needed to get his weight down so he would be healthy and have a longer life. They developed a weight loss plan for Jack. It soon occurred to them that, if it worked for Jack, it would work for other pet parents and their overweight companions. They set out to develop a business: Slimdoggy.com. It includes an iPhone app and a blog. “All because of that photo I saw of Jack on Petfinder,” Kate says. The O’Briens are doing a good thing for pets because obesity is a “growing” problem. Petfinder addresses it in its Fit FurKeeps initiative. Slimdoggy.com is not the only business I’ve heard about that was inspired by an adopted pet. Read Johann’s story in Leslie’s words. 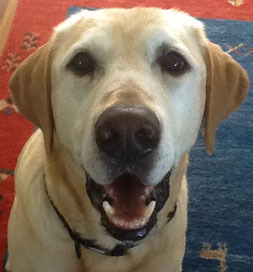 The first I remember was mentioned in a happy tail from Leslie May of Carmel, IN, in 2006. 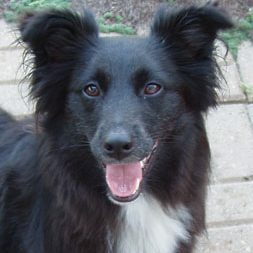 She had adopted Johann the dog, a black Shetland Sheepdog, from Southside Animal Shelter in Indianapolis two years earlier. Sometime after that, she launched a website called johannthedog.com. It has all sorts of canine accouterments, from collars to toys to beds and treats. She donates 10% of the proceeds from sales to animal shelters and rescues. The website also includes a blog. I remember johannthedog.com because that was the first canine-inspired business I remember hearing about via a happy tail. Slimdoggy.com is the latest. What stands out to me is that the stories we receive show how many ways people blossom after adopting a pet, from gaining friends and companionship to becoming healthier, both physically and emotionally, and even to launching a business. It’s pretty cool!